This dark, brooding mysterious print encapsulates Cucchi's dictum that a picture must abound in elementary powers suggesting, as it does, some primal forces at work in the darkness, an irradiating light that shines forth from the blackness to focus on or create the image of the elephant in the title of the work, an allusion to the legends and ancient culture of the artist's Italian heritage. 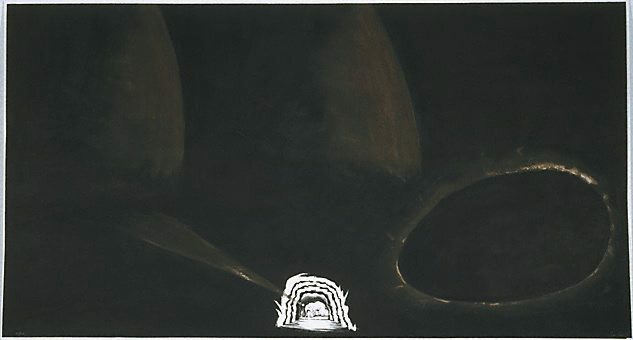 The dark egg shape, an image recurring frequently in Cucchi's work, hovers in the blackness, radiating light as if to suggest some elemental life-force. 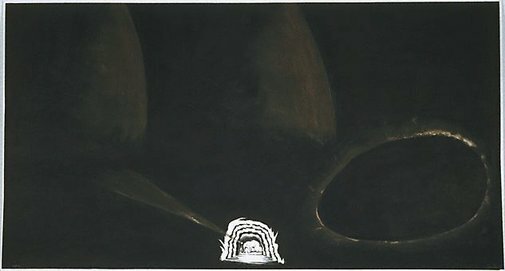 'L'Elefante di Giotto' whose overpowering size is not only a technical tour de force, is redolent with a kind of primordial simplicity, haunting in its power and beauty. Signed l.r., pencil "Enzo Cucchi". Not dated.